Is there anything more intoxicating than the smell of apples and cinnamon baking in the oven? For me ...no. This is the time of year I long for. Cooler weather sends me into a frenzy looking for different ways to bake apples and cinnamon. I'll sit in the kitchen and linger over the aroma coming from the oven, simple little pleasures coming from my kitchen. 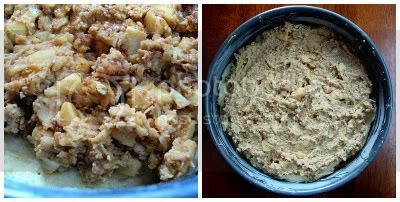 Cyndy and I have put together an all apple dessert post, easy delicious recipes that will hopefully find they're way into you oven. We hope you enjoy them as much as we have. I started this recipe by buttering and flouring a 9 inch springform pan. 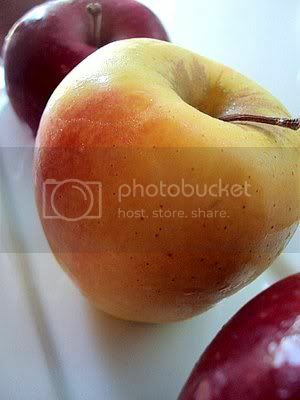 I peeled, cored and diced 2 large apples, I used Yellow Delicious because that's what I had. I sprinkled a tablespoon of lemon juice over the apples to keep them from turning brown while making the rest of the recipe. I made the cake portion of the cake. The batter is very thick, not pourable....but spreadable. I made the streusel/ filling in my food processor, it was easy and fast to put together. I did add 1 teaspoon of cinnamon to the filling instead of the 1/2 tsp, I'm a cinnamon apple kinda girl and 1/2 tsp just didn't seem like enough. Spread half of the cake batter into the greased and floured 9 inch springform pan. Top the cake batter with half of the streusel/filling. Then repeat the layers again with the remaining cake batter and streusel/filling. I baked the coffee cake at 350 degrees for about 50 minutes. OH my goodness this was so good!!! It was so soft and moist, absolutely worth the effort! 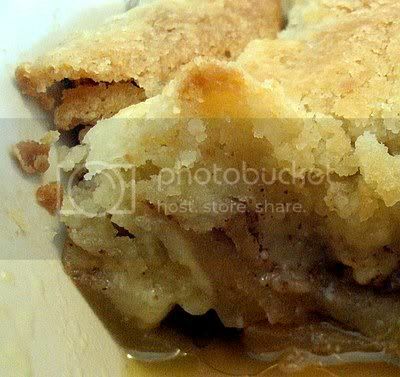 Easy and delicious apple pie, your gonna love this one! Serve with vanilla ice cream just like apple pie. 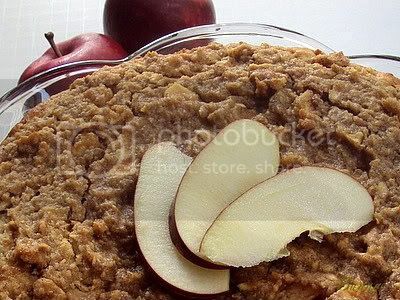 Fill pie plate 3/4 full with sliced apples. Sprinkle with 1 Tablespoon sugar mixed with 1 teaspoon of cinnamon. Pour over apples and bake at 350 degrees for 45 minutes. Nana Bev's comments: "This recipe was given to me by a friend several years ago and one that I had forgotten about. I came across it the other day and made it for dessert for supper. It is so easy and so yummy. It is great served warm with vanilla ice cream and it smells so good near the end of the baking time." Everything y'all make is always so gorgeous!! What fabulous fall treats. The ricotta cake is especially calling my name! 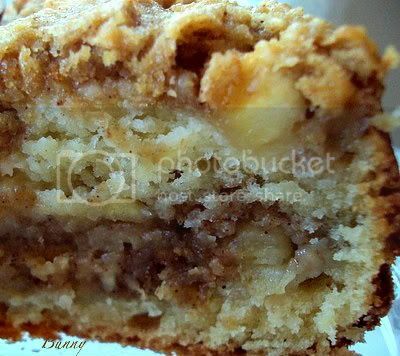 I HAVE to make that apple coffee cake--it looks incredible. Well, it looks plain Jane from the top but when you slice into it--wow. Must make! That pie is calling me too! Yummm! You ladies, once again, are really speaking my language. I, too, am just obsessed with apples these days. Apples and cinnamon--what a glorious scent! Each of these recipes looks just delicious. Beautiful photos as well. We can tell that fall is here when the apples appear. Three delicious dishes to choose from. Thanks ladies. They all look so good but I think I am going to try the apple ricotta cake first! I'm in! BUT I'm so torn between the ricotta one & the ease of the crumble, then of course, we have the sugar cookie-ish crust from the pie! A yummy start to the Fall season! As always they all look extremely delish!!! I loveapple season and I can't wait to bake up something with them this weekend! Love this time of year with all the goodness of apples. Yummy! The smell of apples and cinnamon is what dreams are made of. This looks incredible. 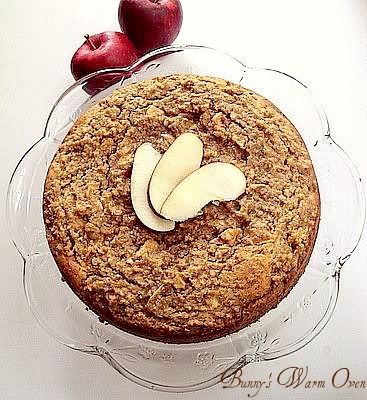 It makes me so happy that the blogs are so full of apple cake recipes recently. Ricotta is a wonderful addition. I think that Swedish apple pie is also a great twist on a classic. omg, they all look fabulous, but I guess I should be partial to that Swedish Apple Pie (being Swedish and all). I had just been thinking of apple desserts! They all looks amazing! Apples, apples, apples! Three delicious desserts... they're the best thing about Fall! Wow, that's a whole lotta apples. they will keep an army of doctors away! I am really intrigued by that swedish apple pie...going on my list for sure! Thanks so much for the warm "welcome back." I'm glad to be here, especially to see this amazing batch of recipes for apples. Incredible! And I love, love, love ricotta in cakes. I should never have come here. I have been craving an apple dessert for days and here they are - untouchable. You cannot go wrong with an apple dessert but you have to know I am coveting the ricotta cake. Oh my! Seriously, do you have ANY idea how much I truly love apple desserts. I mean we are talking truly, madly, deeply. This is more than the apple of my eye; we're talking the whole bushel here. Big big YUM YUM YUM!!! This is a message for the webmaster/admin here at wwwbunnysovencom.blogspot.com. ALL of your photos are beautiful (Love the gorgeous leaves too) and your recipes sound delicious! You have a wonderful blog here!